It’s a bouncy Rick Rock track that has all the signature spareness of a hyphy production – 180 degrees from the syrupy and lush North Carolina beats that had informed his last two solo full-lengths. Perhaps to signal his acceptance of a changing tide in the underground, Murs switches up his flow dramatically here, borrowing syncopations equally from The Pack and E-40. (Murs has done a few recent collaborations with E, which may have informed his stylistic shift.) It all comes together quite nicely; this is easily the best hip-hop track this year to namedrop Pacman Jones. 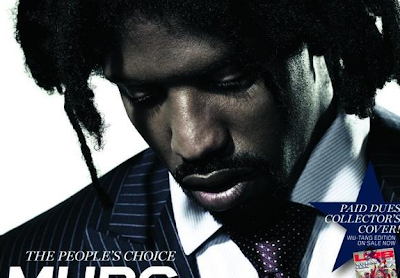 As if to signal the finality of the change, Murs has ditched his signature beard to sport the unstoppable Lif-esque dreads pictured on the URB cover above – but, as he laughs in “Dreadlocks,” “Some people got a hundred/I got about nine.” Even after changing flow, production, and hair, Murs hasn’t abandoned his signature self-effacing humor. Looking for new music? Click below for more recent and upcoming releases, or visit the MP3-filled Album Release Calendar.